We rested in the morning, CK felt like she was coming down with something. We decided that hanging out at a movie with friends, as we'd planned the night before, was still something we both felt up to doing. We met up downtown to see Terry Gilliam's new movie. Afterward we got lunch from the Bombay Chaat House cart, enjoying it in the new park downtown. The day wound up at Powell's, mostly just to have coffee, and a quick shopping trip. We both really enjoyed connecting with some new friends even though we felt pretty tired as we headed home. For today's poem I played around with the 3 line format of a 5-7-5 (syllables) haiku. Stringing several of these sets together to evoke the experience of lunch. Several of my tattoos mark a milestone in my life of some sort, mostly age related. My feet I had done when I finished my first round of Yoga Teacher Training and started practicing Zen. 2009 has seen some really big milestones for me. I finished round two of Yoga Teacher Training (an additional 230 hours). I went to two sesshins. I received Jukai and was given a new name. I started turning my steps towards the truth of myself, even though it hurt both me and others. A big year deserves a big tattoo, a big reminder of my accomplishments. I have such a difficult time recognizing my accomplishments that maybe it takes a rather large tattoo I can look at every day will help me remember that I owe myself some appreciation & congratulations. It will be my touchstone to reality whenever my Inner Critic says I never finish anything I start. All that in mind, I had a quite large tattoo started today. It is a little over half done after half a day with the artist. I am exhausted. My right leg aches like it has been burned (normal) and the rest of my body aches from the constant tensing to be still on the point of pain. I'm mostly lying around tonight, leg elevated. There's interesting practice in tattoos. Really, to be done well, it helps that both the receiver and the giver are present to the art and the bodies. The body receiving, the body giving (which also experiences a specific pain of holding stressful positions and constant vibration starting in the hand). The pain keeps the receiver from straying too far from the present moment and a good artist is focused on the art. The noise both giver and receiver share. Even if you put on noise-cancelling headphones you still hear the noise inside your body. On that point, at varying levels of sharp, insistent pain, the two people stay in complete focus. Here's what my newest tattoo looks like with all the stencils applied to my leg. 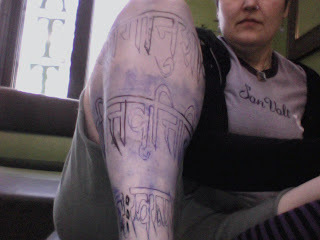 In some areas the stencils wouldn't fit right, so the Sanskrit is hand drawn in with a Sharpie. Doing just this part took quite a while because there are three large lines of very straight text. These then must be adjusted to taper down the leg (this was done by Bryan already by means of hand drawing and working with the file on their Mac). Oh, and the lines should have the appearance of being "straight" around the leg. Don't forget - the lower leg is full of flat bits, soft bits, curved bits, hollow bits, bits that stick up, etc. It is not an optimal surface for this kind of stuff. I took some before shots of my bare leg and some "in progress" shots today. Right now it is wrapped up in day-glo pink compression tape, a large bandage around the ankle particularly, and cling film. I'll take a shot in a day or two once the back starts to clear up a little. The final product is the first three of the Yoga Sutras by Patanjali. Each line will be solid black at the top, fading into blue at the bottom of each line. If you've seen the tattoos on my feet, this work is being done by the same artist. The Sutras go from 1.1 on the top to 1.2 in the middle and 1.3 around the ankle. 1.1 - Now begins the practice of Yoga. 1.2 - Yoga is the settling of the mind into silence. That is the beginning of my practice of both Hatha Yoga and Zen Buddhism. First we begin to practice. Practice is the stilling of all the mind-noise. When we experience the stillness of a quiet mind we experience the essential truth of the self, or of the no-self. Something I like about Tri-Met are the bits of poetry hanging in the buses & trains. It is part of a project called Poetry in Motion. Up between signs reminding you to wear headphones, give up your seat for someone who needs it, maps, advertising, etc. there's poetry. Pretty simple and it certainly falls into the category of "Small Happinesses" in my life. Right before leaving for Hawaii I spotted this one on the way home from the office on the Number 4 bus. To the color of flowers. Catches your gaze, water flows. 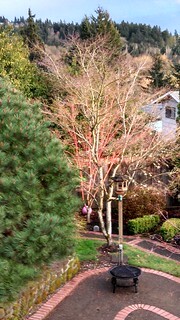 Days after it stopped raining. After working so hard yesterday CK and I rewarded ourselves with a lazy, wandering day. Went downtown, got coffee and enjoyed it sitting in Pioneer Square. Then off to catch The Brothers Bloom, which was excellent, has wonderful music, and beautifully filmed. We then just ambled around downtown, making our meandering way to the Saturday Market. We even indulged in a little bit of bargain shopping. CK found a great white dress shirt with French cuffs and a blue striped tie. She modeled them for me when we got home and she looks awesome! I found a t-shirt with a pattern on it that reminds me somewhat of collage and has beautiful butterflies and dragonflies on it. I nearly didn't try it on -- one of those moments where I pick something up, look at it and decide it there is no way something so small could possibly fit me! CK insisted it would fit and encouraged me to at least try it on. It is meant to hug the body, but similarly to the way my yoga clothes do. I was glad she got me to try it! I found a black sweater hoodie printed with a fantastic butterfly motif - just that kind of day. It has been so busy for so long that it was wonderful to just have a quiet day together. We talked a lot about the appreciation we have for each other. She asked me if I thought we were a good team and I said yes, without hesitation. I said what was more amazing was that I felt like there is consistency; that my "teammate" was consistently a good, supportive partner. To end a beautiful day we came up and I made up a salad from the ideas she gave me. We got to sit out on the newly cleaned off deck in the cool breeze and enjoy dinner together. I found myself looking at her while she's unaware, something she catches me doing a lot, but at times I just like to watch her and be present to my joy & gratitude. On the long list of things I love about Portland are pubs. Not bars, but pubs, "Public Houses", places where people gather together. Pubs serve alcohol, but they also create space for community to grow stronger, closer. During much of the day children may be present with guardians. This evening at the Green Dragon in SE PDX there is a table full of parents who have bicycled here with their babies. Across the narrow aisle from me are 4 children sitting with their parents, playing with chalk on the tops of the tables (designed for this purpose). There are bicycle helmets on the bars and computers out everywhere, taking advantage of the free wireless network. I looked around a few minutes ago and commented to CK that it was such a typical Portland moment. The computers, micro-brewed beer, bicycle gear, rain gear, and people of all ages sharing the space together. It is friendly, warm and noisy. Yes, the are way more laptops since it is the weekly Beer & Blog meet up. Mostly beer, but peers helping one another with technical issues does happen. CK spent a few minutes helping YW out with a systems admin issue earlier while I sat reading messages. She's also been working on my website. I'm not sure if it is part the weather or in part that Portland is filled with people that either stay here or move here because of the community energy here, but it is something that elicits absolute delight in me. It shows up in coffee shops, bookstores, at the grocery store checkout, the farmer's markets, the library and too many other places to mention. People of all ages sharing space, knowledge, and in a very community way, Loving-Kindness. Today we slept it, which felt wonderful! Once we all were up and showered we decided upon Vita Cafe (really like the new space) for a big breakfast and then up to the Downtown/PSU Farmer's Market. It meant we got there past noon, much later than either CK and I usually get to the market. We were not very surprised to see that some stalls didn't have as much left. Musicians were all around the perimeter of the market and the band that was playing in the center was awesome! We quickly picked out some asparagus then looked around for rapini (none to be found, sadly). Since we hadn't found rapini we decided to get some chard. I also grabbed a small bunch of spring red onions - shining red bulbs and stiff green shoots. Some vegan basil, garlic, mint pesto was sampled and purchased for dinner later. I also got some fiddlehead ferns to try out. CK and I picked out some more starts for the garden. She found a yellow watermelon and a spaghetti squash. We also got two types of lettuce and some red choi. Then vendor at that stall had a broken Italian bush bean (1 out of 6 starts in the tray was damaged) that she gave to us free! The last two chocolate panini at the Pearl Bakery booth were purchased and then we decided to get a "soda" made from fresh raspberries, lemonade and mineral water. This was very refreshing and tasty. We enjoyed these while heading over to Pearl Bakery to see if we could get a round boule of their multi-grain bread. They didn't have any left so we picked out a cibatta to go with the veggies with dinner later. Brought the market goodies back to the house and decided to drive up the Gorge a little bit since NR has never seen it. As we drove past falls we made a spur of the moment decision to continue east to Hood River. Once there we went to the Full Sail Brewery and had a late lunch with beer. Then down to the river to watch the windsurfers and kite-boarders. Back to the house CK and I worked on the yard a bit. I planted seeds for various lettuces and greens as well as the starts from the market. Still need to find homes for 3 more of the bush beans. CK leveled out the area by the compost pile so that she can make mounds for all the winter squash and melons. Then inside for a late dinner of grilled, baked tofu & tempeh with pesto. Chard sauteed with the red onion and a little minced garlic in olive oil, tossed with balsamic. Seared, steamed asparagus with sea salt. Plus crispy slices of garlic bread. All of it was so delicious. Made for a long day, but it was a lot of fun showing off our city and state. I really enjoyed being able to go from the Farmer's Market to a delicious dinner later. That CK & I also managed to squeeze in a little garden time ourselves was very cool. CK and I both work pretty hard on our various "work" projects and other things like yoga, Zen, and various connections with the Open Source and other communities like Love Based Living. It is pretty easy for us to just take a night off. Setting an official, on the calendar "date night" was discussed and tonight was our first official one. When I left the building to walk over to Backspace I felt lighter and was happy with the warming weather, puffy white clouds & blue sky, and the sun lighting up all the green leaf buds on some trees and pink or white flowers on other trees. I was smiling at the late afternoon and as I walked past people they would smile back, regardless of who they were. She wrapped up working and I checked email while having a creme soda. We decided to wander over to Shanghai Tunnel for a beer, mostly because I'd never been there before. This well known Portland bar, CK has been on a visit, but hadn't. It was OK, comfortable enough and people generally friendly. We played a couple of rounds of pool and decided to move on. Bailey's Taproom was next. I think in my heart I'd never gone in since it occupied the space where Lampthong Thai once was. It was very comfortable even though it was pretty crowded with people. CK ran across the street to the convenience store to grab a bag of pretzels since Baily's only serves beer, and we enjoyed a sampler tray of our choice of beers. We popped into Saucebox very briefly before ducking out again. I hadn't been there in years and only really had cocktails there. It was very loud, very trendy, and CK noted that it felt like San Francisco (in a bad way). Nothing on the menu really grabbed us as enticing enough to stand the atmosphere. While the staff were occupied we left quickly. Onto looking in the window of Dragonfish. Again, nothing really jumped out at us as decent for dinner or even snacking. Sushi sounded good, as did miso, but we knew that we'd have to wait for a visit to Mio. Since we were near Southpark we popped into the wine bar. The wait person went back to the kitchen to find out just what could be made vegan and came back with some suggestions we're going to keep in mind for the future (they offered to make risotto, fresh pizza, or linguini - any with an assortment of seasonal veggies). We ended up with their hummus, fresh flatbread, and fried chickpeas. The wine at Southpark is always great. That's why we ended up in there, we at least knew the wine would be nice even if we moved on to eat something somewhere else. The flatbread & hummus plate usually comes with tzatziki but since we obviously wouldn't be having that they just added the chickpeas we wanted to that plate. All tallied up we ended up only paying for two glasses of wine and the flatbread plate! Nice touch on their part since quite often having some accomodation for a vegan often costs more. The hummus was very garlicky with a nice tang of lemon and heartier than the more traditional, ultra-smooth kinds (like at Hush Hush, Nicholas Restaurant, or Habibi). The flatbread was freshly made and so tasty that we will try their offer of a custom pizza some other evening. The fried chickpeas with lemon were so tasty, lightly crispy on the outside, and with a bright, lemony burst of favor! I felt a bit better today over all and not just because of the fun evening we had. Zazen and making myself write last night helped some. I also was able to fix something before heading downtown this morning (with the help of KE's extra eyes on my code we found a problem I was stuck on). I enjoyed myself at the Geek Chix lunch meet up at P.F. Chang's then walked over to the office for the afternoon. I felt like I caught up on a few things, which helped with starting to feel a bit more focused.